MURPHY (nee Murnin) ( Banbridge/ Hilltown ) 11 April 2019, Mary. Peacefully at Newry Hospice surrounded by her loving family. Beloved wife of Kieran, much loved mother of Mark and Colin and loving sister of Joe, Seamus, Ann, Thomas and Agnes. Mary’s remains will repose at her son Mark’s residence, 5 Lower Ballyweely Road, Cabra, BT34 5FL from 5pm this evening ( Thursday ). Her remains will leave on Saturday at 11.15am for 12.00noon Requiem Mass in the Church of St John the Evangelist, Ballymaghery, Hilltown. Burial afterwards in the adjoining cemetery. St Therese pray for her. Deeply regretted by her sorrowing husband, sons, brothers, sisters, brothers-in-law, sisters-in-law, nephews, nieces and the entire family circle. Family Flowers only. 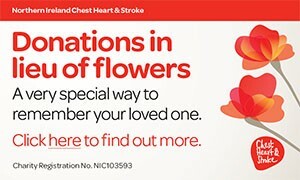 Donations in lieu of flowers if desired to Newry Hospice c/o Peter McGinn Funeral Director, 41 Leitrim Road, Hilltown. I am sorry to tell you that Mary Murphy has passed away.